Rev. David A. Bigley has over 30 years of ministerial experience. He has a diploma in Bible and Doctrine and Pastoral Studies from Berean College in Springfield, MO. He and his wife Lorraine have four adult children and eight grandchildren. Rev. Bigley is ordained and has ministerial standing with the Christian Church (Disciples of Christ) of Nebraska and has been serving as the pastor of the First Christian Church (DOC), since April 2004. 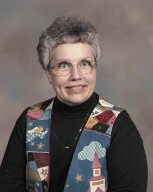 Carol Arpke is the Director of our Children's Ministry. Carol plans and oversees the LAB's (Learning About the Bible) program which is an after school program for children age 4 through grade 5. Carol has a love for children and she helps coordinate programs to meet the needs of children and youth.